Last night I was invited by a parent at my school to attend the Tech Awards in San Jose, a really impressive benefit that honors those who create innovative uses for technology to benefit humanity. It was awesome, and will absolutely get a few more blog posts when I get some time. 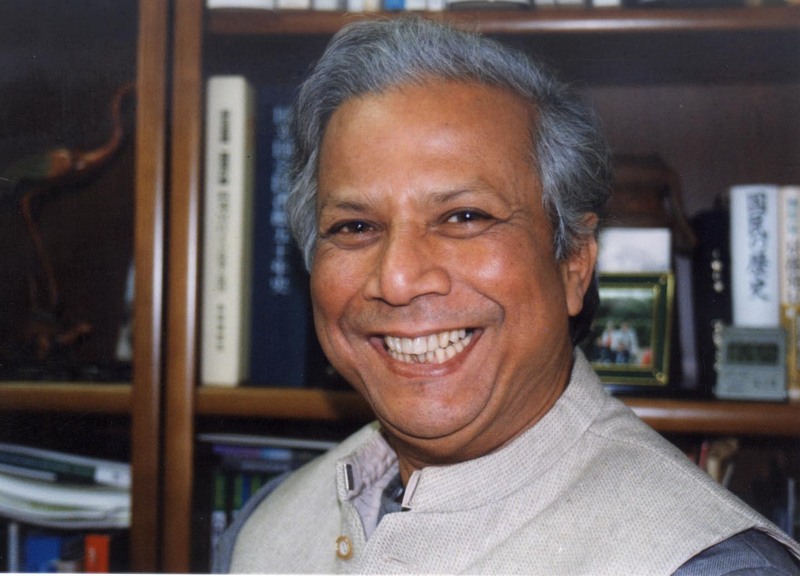 But I can’t resist the opportunity to write immediately about the keynote speaker, 2006 Nobel Peace Prize Laureate Muhammad Yunus. Yunus, for those who do not know, is credited with creating and popularizing the concept of microcredit…in other words, giving impoverished workers small loans ($20-50) to jump start a small business, and to build themselves out of poverty, while ultimately paying the loan back at a small interest rate. As he says, helping people while allowing them to keep their dignity. The idea has gained significant traction since he introduced it, and is best known through sites like kiva.org, which allow you to choose to whom you want to make your loan. It was a true honor to see Yunus speak last night. He carries himself with the type of serene humility, despite the invaluable contributions he has made in the fight against global poverty, that is reminiscent of Mother Theresa. In the beginning his speech, he was clearly overwhelmed emotionally by the continued recognition that his idea has gotten him. When he first went to banks in Bangladesh with the idea of loaning $20 to poor workers, they laughed him out of their offices. As he realized, banks lend to those who already have money. Speaking in the midst of a global financial meltdown, one which was precipitated by the reckless practices of rich banks lending money to other rich banks, Yunus was quick to pick up on the irony of the situation. His microcredit banks were doing just fine, and their loans were being paid back, all 700,000 house loans that he lent out….while the big guys, well we all know they are not faring as well. He told one anecdote about Social Business that I think is particularly worth repeating. Social Business is a concept he also seems to have invented. Investors back a company with start-up capital, but only get their initial down payments back, and do not get to collect on the earnings. As such, it is the local workers who reap the benefits of their work, not fat cat investors here in the United States. He has cleverly talked several major wealthy corporations into opening Social Businesses throughout the world as side projects to jump start sustainable and local economic growth, each to great success. Yunus OK Dannon, you guys are a really rich company, have wonderful success, I’d like you to start a social business here in Bangladesh to fight malnutrition. Dannon We would love to help out Dr. Yunus, with your guidance. Let us know what we can do. Yunus Right. Well first off, we don’t really want plastic cups for the yogurt. That’s going to create an even bigger trash problem than what we already have in Bangladesh, and in social businesses there’s no need to waste money on fancy packaging or fancy marketing. I just want these poor people to pay for the yogurt, not the decorative cups. So you will cut costs significantly if you can come up with a simple, biodegradable cup for the yogurt. Dannon Great idea Dr. Yunus, we will work on it. A month later, after developing a product in China. Dannon Dr. Yunus, we have found a wonderful biodegradable cup made from corn starch in China, it completely composts back into soil and should work really well for our yogurt in Bangladesh. Yunus Wonderful news Dannon. I knew you guys could do it. Now is it edible? Dannon I’m sorry, did you say edible? Yunus Yes of course, edible. When I go to the ice cream shop, I’m a cone man. I like the taste of cones, and I like that I can eat the container. Is your corn container for the yogurt edible like an ice cream cone? Yunus Yeah, ice cream cone. You guys are Dannon, a wealthy and successful company, I am sure you guys can come up with it. Dannon OK, but I think it’s going to take us at least a year to come up with something like that. Yunus Let’s make it 6 months. I look forward to seeing the product then. As Yunus indicated in his speech (the story he told about Dannon contains all the same facts as above, and was really cleverly told, I just didn’t get it all down verbatim) that he’s about halfway through the 6 months of Dannon’s R&D on making an edible container for yogurt. It was an inspiring evening with Dr. Yunus. I have never seen a Nobel Laureate speak in real life, and even just to be in the same room with him and 1,500 other awed spectators was incredible. I remain particularly impressed with the concept of a social business, but also left a bit disappointed. Why is it that companies will only act like a social business in impoverished parts of the world, but not in the developed world? Why don’t companies put similarly demanding eco-friendly and sustainable goals on their products for American consumers? Instead, Dannon makes hard-to-recycle plastic cups (plastic 5, and here in San Francisco it’s up to the consumer to go to a recycling depot to drop off any plastic besides 1 and 2) which are mostly just thrown out. So here’s my thought. Yunus was laughed at by traditional free market institutions for advocating microcredit banks, but then now he’s being vindicated for not only helping out millions of people, but for in many ways being more financially secure and, for lack of a better word, right. Therefore, I’m equally optimistic about his business model. If businesses turn more to Social Business practices–minimize packaging and fancy marketing, maximize emphasis on benefits to consumers and local producers–then might we also enter into a world of more fair and stable capitalism? I guess I have to end with quoting Lennon: You may say I’m a dream…but I’m not the only one. Thank you Dr. Yunus for being such an inspiration. If you’ve never heard of the guy, below is a nice long interview conducted by Charlie Rose that will definitely give you a lot to think about. Hai, i am from indonesia.. And right now, i am doing my thesis about him ..
Agree with you he is a very inspiring person, i think this wolrd is need more people like him ..